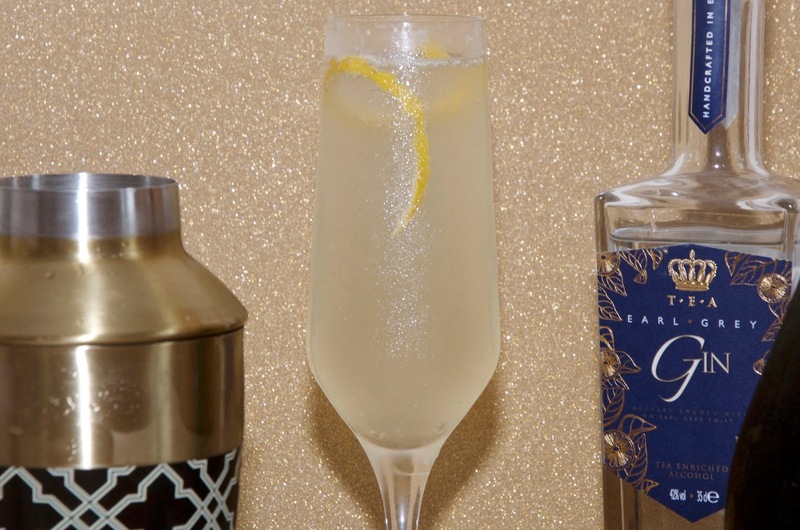 I first heard of the famed French 75 cocktail from a fellow blogger years ago who was having a jolly good time in West Palm Beach and I immediately added it to my list of cocktails to try. Funny enough, I never tried one until quite recently when I visited Duke's earlier this summer, the well-known London watering hole where Ian Fleming used to drink his martini's, shaken not stirred. 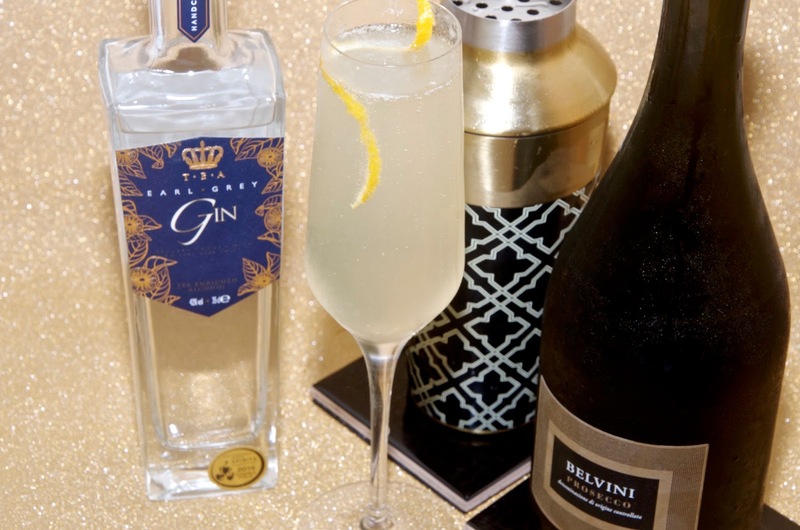 When I first heard about T.E.A., a brand of tea enriched alcohol, I couldn't stop thinking that a French 75 with a British twist would need to be on the menu for my next cocktail evening. Having sampled a wide variety of tea-infused cocktails over the past couple of years, it sounded like it would be just right... And it certainly is. Lemon is one of the main ingredients of a French 75 and it's the perfect complement to tea in my opinion. This unique flavored gin is certainly something special as is this recipe... 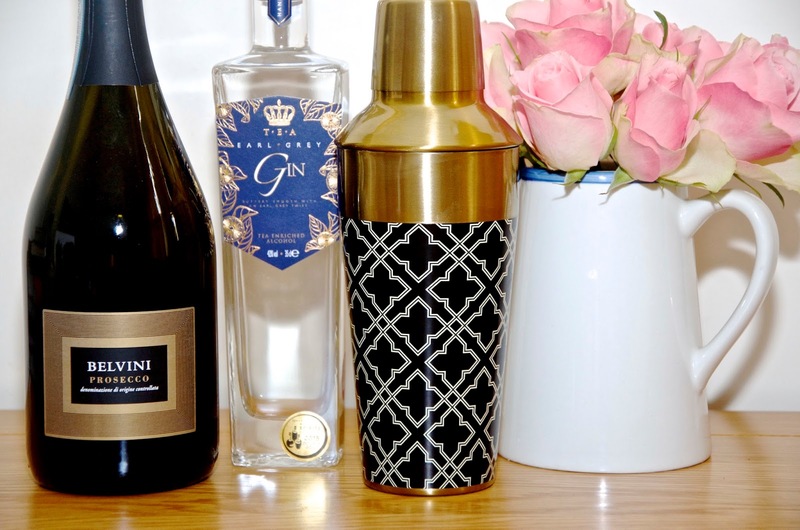 This is the cocktail you'll want to serve at your next fabulous party and while you're at it, splurge on the Bar Craft Art Deco Brass Finish Cocktail Shaker from Kitchen Craft... It's Gatsby-fabulous and adds a sense of occasion to any bar cart! 1. Start by making the garnish, using a zester to slice a long spiral of the lemon peel and set aside. I usually do a few of these off the same lemon before I juice it if I'm making more than one drink and keep them handy. 2. Fill a cocktail shaker about halfway with ice. Add the T.E.A. Earl Grey Gin, simple syrup and freshly squeezed lemon juice and shake vigorously for about 30 seconds to combine and chill. 3. 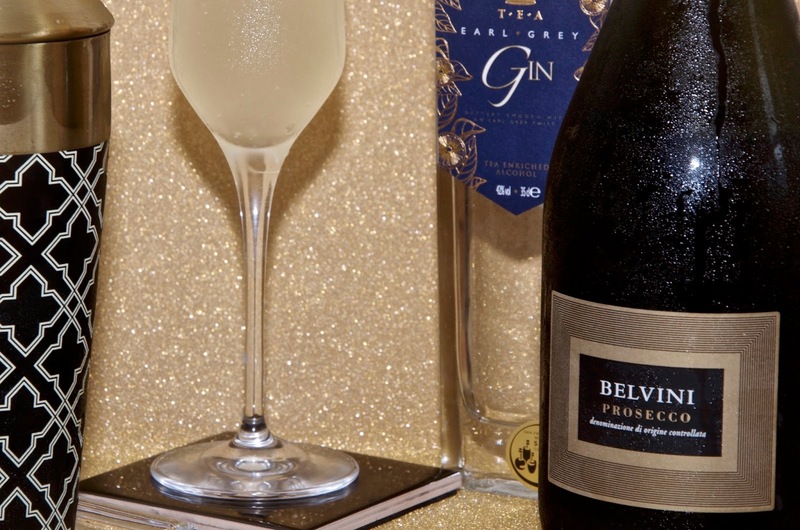 Strain the liquid into a Champagne flute or the glass of your choice and top up with chilled Prosecco. Finish with the garnish and serve cold. Belvini Prosecco retails for £8.00 - click here for more information or to buy. The Bar Craft 650ml Art Deco Brass Finish Cocktail Shaker by Kitchen Craft is currently available at www.silvermushroom.com for £14.95.